IF YOU don't lock your car, you can get fined $40. Not to mention you risk having your property stolen or damaged, but the fine is a deterrent to owners who fail to secure their vehicles. In the past financial year, 215 cars were broken into within the Gladstone region, and an additional 46 offences reported in the wider Gladstone region. Inspector Darren Somerville implored car owners to remove temptation from the eyes of potential thieves. "In the last financial year period, we saw a 13% increase in offences," he said. "Take the temptation away. Don't leave valuables on display and lock your vehicles." While the message appears to be fundamental, figures are suggesting Gladstone residents are becoming complacent. In a joint mission to ensure the message is received, notices have been erected across the region to act as both a warning and reminder. Signage can be found at the marina, Lake Awoonga, Gladstone airport and various car parks care of Newprint HRG. 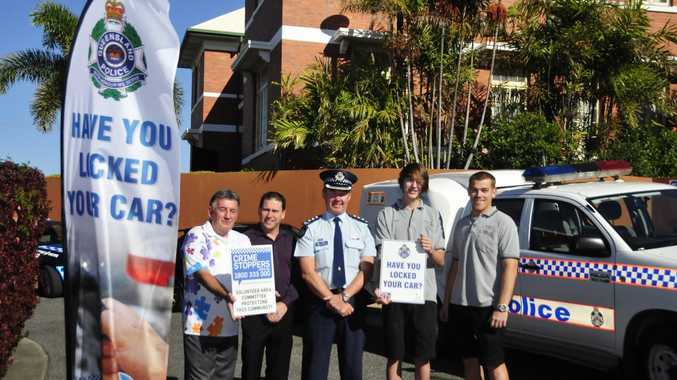 Gladstone Crime Prevention Officer Senior Constable Ann Jessop said the message was simple: to protect your property, lock it up. "You'd be surprised what people leave in their cars; we've had everything reported, including a kitchen sink." She said tradies' tools were another big-ticket item thieves pursued.